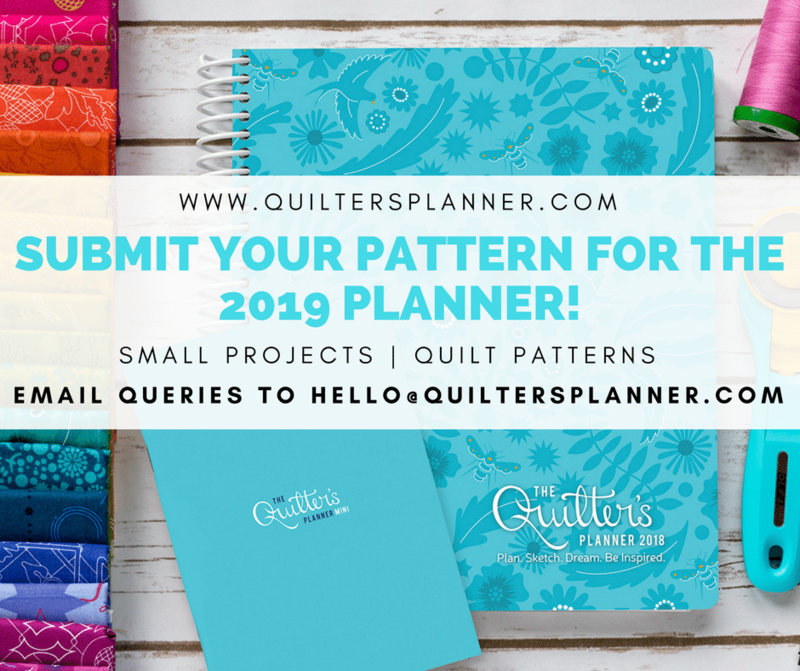 If you’ve thought it would be fun to have your quilt pattern published in the 2019 Quilter’s Planner, now is your chance! Submit a digital rendering of your idea plus a query note introducing yourself to hello@quiltersplanner.com by April 10th, 2018. Please include your social media reach (it’s the way the world spins these days) ;). We are accepting designs for pillows, bags, garments, sewing organizers, as well as quilts. Accepted designs will be notified via email by the end of April. Finished projects are due June 1st, 2018. Quilter’s Planner retains rights to printed and digital pattern for 24 months. Designers may sell their own pattern in their own shop 10 months after publication. Designers may be invited to have their work included in future Quilter’s Planner digital ebooks. We are currently accepting quilting and sewing articles to be featured on our magazine-style blog at QuiltersPlanner.com, as well as for our printed annual magazine that accompanies the Quilter’s Planner. All articles must be accompanied by at least 3 photos (we prefer light and bright for our aesthetic) that are at least 1200 pixels wide. Word Count: 300 to 2500. Guest bloggers are asked to post a link to their post once it is published on QuiltersPlanner.com, and may then publish their article on their own blog after 3 months. Sewing related articles and tutorials: $40-$50 OR two weeks advertising on the sidebar at QuiltersPlanner.com. For sidebar advertisements, the guest blogger must provide an image that will link to their website. The image should be 210 pixels wide x 150 pixels tall. Patterns: Payment is negotiable. Quilters Planner reserves the right to keep the pattern up on the blog in perpetuity. We are currently accepting Customer Service Associate applications. We are looking for assistance in responding to customer emails and Facebook inquiries. Knowledge of Facebook, Instagram, and Pinterest is a plus. The Customer Service Associate is an hourly position. We expect 3-10 hours per week and pay $20/hour. To apply, send your resume to info@quiltersplanner.com.